Tomorrow, dear readers, I will finish the saga of the NAIBA weekend (and try to correct the mistakes I've already made). Wednesday, as I've mentioned, is my day off from the bookstore, and it may take the whole day to recall and recount the events of Saturday and Sunday. In the meantime, look to Shelf Awareness and Bookselling this Week (links at right) for the lowdown on the show and other events. This week will see the first in (what I hope will be) a series of Friday guest bloggers! The first installment will be a piece by Lady T of the witty and charming (and super intelligent) blog living read girl. Her topic: "Confessions of a Former Book Snob", about her complicated relationship to chicklit and other "genre" fiction. It's something I think many of us book nerds have struggled with, and I'm eager to read her take on it and talk back. 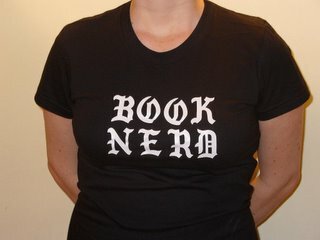 And if anyone would like to write a guest post about the Brooklyn Book Festival, I'd be most interested. Drop me an email if you were there and would like to write up a report for those of us who couldn't make it, skeptics and boosters alike.